It's here. The holiday season. That joyous time of year when you suddenly experience murderous feelings in the mall parking lot, when you send Christmas cards to people you're not even sure you know, and when you're constantly struggling between whether to have that second piece of peppermint fudge or to stay on your diet. Fun times. Here's some help. Skip the parking lot and shop online. Forget the cards; that's so pre-2011. Use Facebook instead. As for the fudge? Stop after one piece; that way you can have a piece of shortbread at the next party. And if you really want to feel good take The Healthy Thanksgiving Challenge spearheaded by Cathy of What Would Cathy Eat? At the age of 44, Cathy underwent major heart surgery for a blocked artery. Two stents later, she recovered but realized she had to start eating more healthfully. While she no longer noshes on decadent desserts and bbq every night, she believes (and I agree) that healthy eating is NOT an excuse for bland food. Healthy food can and should be delicious food. If you too believe healthy holiday eating can be fabulous, then consider taking the challenge and sharing your recipe with Cathy. 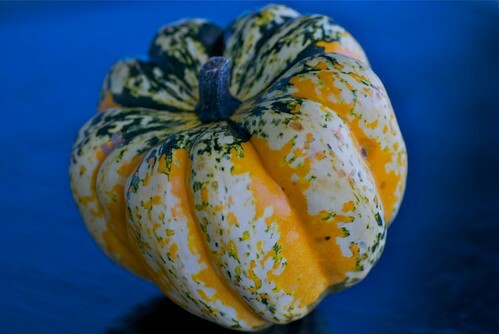 I'm sharing a recipe for Minted Apple and Almond Stuffed Carnival Squash that I make all the time. Why? Because it's easy, attractive, healthy, and delicious. So, enjoy it guilt-free. 1. Preheat oven to 375 degrees F. Line a large baking sheet with aluminum foil for easy clean-up. Slice acorn squash in half and remove seeds. Brush flesh with a bit of olive oil and place flesh side down on prepared baking sheet. Cook 35 to 45 minutes, or until tender when pierced with a fork. 2. In a medium skillet, warm 1 teaspoon olive oil. Add shallot and saute 3 to 5 minutes, until soft. Add apples, lemon juice, salt, and black pepper. Cook for 3 minutes, or until apples are just tender. Remove from heat. Taste. Season with additional salt and pepper, if desired. Stir in the almonds and mint. 3. Divide filling equally among the four squash halves and heat in the oven for 5 to 7 minutes. Before serving, garnish with chopped almonds and chopped fresh mint, and drizzle with a little bit of extra virgin olive oil. We should all be eating healthily over the holidays, it is such a season of indulgence in every way.Loving your heart healthy squash Susan. Love the sound of this recipe. I haven't seen that type of squash here; will look for it. That's a delicious looking and sounding recipe and not just for the holiday season. val-I agree. I feel better when I enjoy holiday treats in moderation, so I really avoid the holiday splurge. kalyn-Really? I'm surprised. Keep looking! It tastes like acorn but it's just more colorful. becky-Thanks for including me in your Pinterest board. I've got to get on that! slyvie-Thank you! I appreciate that. lydia-I don't know that farm. I'm surprised by how many people have told me that carnival squash is hard to find. We have them everywhere here. Happy hunting! And you're most welcome about the link -- sounds delicious! This year I'm promising myself to not gain weight during the holidays. Recipes like this will really help. Keep 'em coming! Please! I love this challenge - let's really make this a group effort! Great addition to the Healthy Thanksgiving Challenge, Susan! Can't wait to make it. barb-Good for you! I'll do my best to help. liz-I knew you'd love this challenge! Absolutely, let's spread the word! cathy-I'm glad you like it. Your challenge is a wonderful idea!